Grave Danger is a daily based around the events of the Spooky Food Eating Contest. Riches can be won in the Catacombs below Neovia, but they are full of curses - good job Petpets are immune to them! In order to play Grave Danger, you must have a Petpet attached to one of your Neopets. You will be prompted to select one of your Petpets by clicking on it. If you have any equipment from the NC Mall, you will be able to apply them at this stage. When you are ready, click the button to send your Petpet down into the Catacombs. NOTE: When a Petpet is down in the Catacombs, you will not be able to remove it from your Neopet, or zap it at the Secret Petpet Lab. You will also be unable to trade or abandon a Neopet that has the Petpet attached. If the Turmaculus eats your petpet, a broken image will appear on the Grave Danger page. 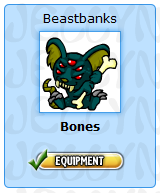 If you attach a new Petpet to your pet, its image will replace the broken image. You will have to wait a while until you get a result - between 3 and 10 hours. During this time, you can get status updates about what your Petpet is doing, which will change every 10 minutes according to the Neopets clock. After the time is up, you can return to the Grave Danger page to collect your prize. Rest assured that your Petpet WILL return - TNT have confirmed that there is no risk of your Petpet exploding/vanishing. NOTE: The 'remaining adventure time' is determined by your computer's time and date settings, meaning any change in the time/date on your computer can cause the remaining time to glitch and display a remaining time of more than 10 hours. When this happens, your Petpet will still return from Grave Danger within 3 to 10 hours of the time that you sent it off. The various status updates that your Petpet can have are listed below. They are largely based on the things that happened to users when they opened the doors in the Catacombs during the Spooky Food Eating Contest. You can find a complete listing of the door outcomes here. Ate a Grumblebug. Batted around an old ring with a triangular symbol. Begging for scraps at the table of a cultist tea party. Being cuddled by an evil cultist. Being taught how to glorp by a Gelatinous Non-Cube. Chased a Skidget past a sewer, a dragon, and a mob of Meepits. Survived. Chasing its tail on Level 92. Chewing a cultist's robes. Chewing a slime-covered shoe left by some unfortunate adventurer. Clambering across the keys of an organ as curses fly in all directions. Cowered in fear as a skeleton shot arrows at it. Danced in a circle with Ghost Meepits. Dancing to some sweet jazz music with a friendly cultist. Dug up some bones and played with them for a bit. Exploring an empty corridor. Followed its nose to the scent of cinnamon rolls. Fought a cult dedicated to the destruction of Neopia... then made friends and went out for cupcakes. Found an old shoe! Grrr... Rawr! Found a peanut. Found a treasure room! Wandered away without taking anything. Got covered in slime... Ew. That's going to take a good scrubbing. Got eaten by a Gelatinous Non-Cube... and was spit back out. Got stepped on at a cultist dance party. Had a sneezing competition with a dragon. Had a staring contest with its doppleganger. Invited to be mascot of a cult. Declined the offer. Located some bacon. Mmm, catacombs bacon. Made friends with a pile of Spyders and played Chase the Vernax. Making friends with a giant Globilol. Nearly got eaten by a Gelatinous Non-Cube. Observing a banjo duel with some interest. Played tag with a Psimouse. Ran away from a hungry zombie. Rolled in a heap of discarded dung cream sandwiches. Rooted through a pile of old cultist robes. Running away from a fire-breathing dragon! Sitting around on Level 83. Stepped in glowing ghostly residue. Tried on some mummy bandages. Walking backward with a pair of mummies. While your Petpet is 'adventuring' in the Catacombs, you may notice that its image will change on Neopet Lookups, and when you play with the Petpet. The first time that you visit the Grave Danger page after your Petpet has returned from the Catacombs, the prize shown will be placed into your inventory. Unless you click "Adventure again!" you will continue to see the same prize shown each time you visit the page, but it will only be awarded to you once. If you wish to simply back out of the prize screen, just click "Adventure again!" Your petpet will not be automatically sent back in. By equipping one-use NC Mall equipment when you send your Petpet into Grave Danger, your Petpet will bring back an exclusive NC Item in addition to a normal item prize. NC is not required to play the game normally, and does not offer any advantages in the main game. The only equipment currently available in the NC Mall is the Ghostly Wand of Spades. 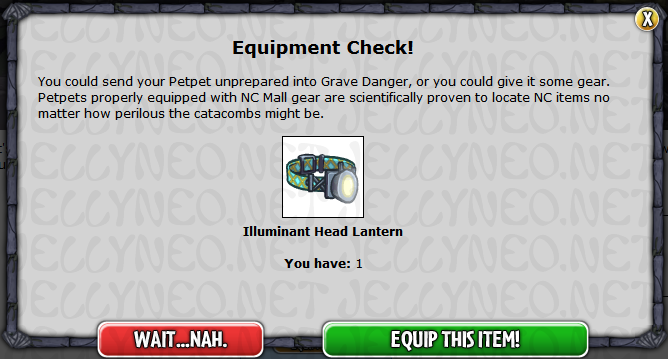 The Illuminant Head Lantern and Adventurers Sword and Shield are both retired and can no longer be purchased from the NC Mall - but the items can still be equipped and used to retrieve a prize from Grave Danger. Unlike normal ticket-type items, the equipment does not need to be activated. Clicking on them in your inventory and trying to use them there will just redirect you to the game. You just need to have the item in your inventory when you go to play. Then, when selecting a Petpet to send into the Catacombs, you will be given the option to equip it. Your equipment may only be used once. Clicking on the item, then on 'Equip this item!' will properly equip it - at that point, a green check mark will appear next to your Petpet - this signifies that the item is properly equipped and that you are ready to go. You will need one piece of equipment for each time you send a Petpet into the Catacombs. IMPORTANT NOTE: You must purchase and equip the equipment before sending your Petpet into the Catacombs. They will not work retroactively. When the Petpet returns from the adventure, it will be carrying an additional NC prize. There are 10 in total, and it is possible to receive the same prize more than once as the prize selection is randomised. As the Grave Danger game awards Neopoint items, you cannot participate on your side accounts.